We’ve been very busy here at CrossFit Liberate. Our tentative opening date is…….. Cannot believe it’s finally happening, and yet we’re totally ready to open and host y’all for some fitness. Make sure you stay tuned to everything going on via our social media channels – Instagram and Facebook. We’ve hosted community WODs at Bishop Park, Fleet Feet in Five Points, Creature Comforts (mmmm, beer), and Lululemon. If you’ve joined us, we thank you for trusting us with your fitness and we appreciate your support. This week, things have really been coming together at our facility. Where is it, you say? We’re located in an old seed mill in downtown Athens, at 425 E Dougherty St! Our vast 35ft ceilings mean lots of air to move around, so we’re jazzed that our two 14ft high volume ceiling fans were finally installed. They look amazing and very powerful! These will be keeping us cool in the hot months, and recirculating lovely warm air in the winter! Even bigger news is that our flooring, locker rooms, bathrooms, turf room, and childcare room are in place and nearly ready. Our bathrooms and locker rooms are air-conditioned, and each has two sinks, two toilets, two showers, and a 24-count bank of lockers which we’ll have available for rent or day-use. You’ll be able to sweat it out and lay it all out there, and then get perfectly cleaned up for work or a night out in these amazing locker rooms. The turf room has cushy athletic turf installed seamlessly, just like our main floor. We’ll host our Foundations courses in here, as well as program WODs with all kinds of turf appropriate activities – shuttle sprints, tire flips, sled drags/pushes, yoke carries, and gymnastics. So much room for so many activities! And finally, our childcare room features the same eCore Rally flooring, air-conditioning (!! ), playful lighting, and plenty of toys for the kiddos. Childcare is complimentary with your membership, and we’ll offer that during our afternoon classes to start. Just ask your coach for more details. Childcare will be staffed by a separate, dedicated staff member to ensure their full attention is devoted to your kids. Ages 6 months to 12 years are welcome. Next week, we’ll be hard at work getting our equipment set up, arranging the space so it’s optimized for fitness, and making final arrangements for opening day. Wish us luck on this final push!! 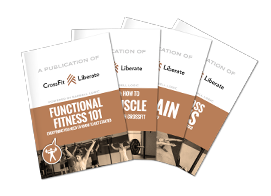 We absolutely cannot wait to share CrossFit Liberate with you. Again, make sure you follow along on social media for the very latest.